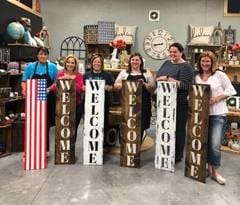 Create memories with your friends and family by joining us to create decor for your home or learn a new craft. We would be honored to facilitate an party you'll always remember! Minimum for private group party is 10 people. We are committed to giving back to our community! Have some fun while raising money for your organization! Please contact us for date and pricing options.